My sister says my blog has died……….. sigh, I HAVE been lazy BUT its also because (TM and STREAMYX – pay attention) the internet connection at my place is SOOOOOOO SLOW, its quite tedious to blog – esp when I want to post pictures! And to think that I actually upgraded my streamyx and am paying RM110 now per month – for what???? Lately, I have not even been able to do a simple interbank transfer!!!!! Ok, so back to finishing my series on Langkawi, but first thing is to post a picture of Allan – he is now officially “lo-fah” literal translation “old flower” which means he is now long sighted (Presbyopia, NOT Hypermetropia – there is a difference, go google it and find out). So he has to peer over his spectacles to read his messages. 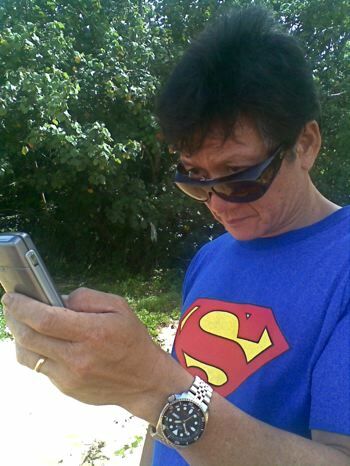 I took a snap shot of it – just couldn’t resist – SUPERMAN having problem with his eyes, hee hee hee. He does look old, but we all still love him, the children and I (awwwwww…….). Have enjoyed your pictures a lot. I expect to be in India and Malaysia in January, what about you? Will be in Mumbai and Chennai.